As a good business practice, the MilitaryAvenue Team is reviewing some of our standard communications to be sure that we are still at 100%! We just recently updated our "Welcome Letter" from our co-founder, Dale Kissinger, and thought... I bet all of our partners would like to review some of our suggestions. So without further adieu here are some great tips to reaching out to our Military Community! Greetings to our new MilitaryAvenue Partners from the Team at MilitaryAvenue.com! We want to expand upon your Welcome email from our co-founder, Dale Kissinger. We realize your time is valuable! So bookmark this page if you need to pause thinking through your very important marketing-plan to your military-community. Be sure to keep your ad up to date. If you have any changes, specials or updates to your ad you can go to the Green Business Tab Log In at any time! Enter your user name and password and then go to Current Listings. Find the Red Edit link and make the necessary changes. Be sure to Checkout and Submit so we review & approve your new edits! Here are some ideas on how to make your Reward a marketing gem! Read More: "Tips: Your Military Rewards and How to Win the Hearts of the Military Community"
Sign up to be an Answers Expert and spread the word about your business expertise! Answers allows the military community to ask questions and seek Answers from others. What a great way to tell others about your business by answering their questions. The questions will come direct to your inbox in your area of expertise only! Read More: You ARE the expert! MilitaryAvenue now has /two/ Facebook pages. another to engage our Military Families (which ultimately engages them in the community that supports them, like you!) http://www.facebook.com/MilitaryAvenue. A quick introduction from you is a great way to generate interest among our followers! You can also find us on Twitter at http://twitter.com/MilAve_Col_K & http://twitter.com/MilitaryAvenue. We place our twitter friends and Facebook fans on both of our blogs as well! Go to our blogs at "Our Letters to You" and "Your Military Community: How to …" to catch up on the news and then see the list of our fans and friends! “Our Letters to You” is how we reach out to the military community with up to date information from DoD, military lifestyle issues plus much more. “Your Military Community: How to …” is our way to help Partners reach the military with ideas and suggestions for marketing to the military. We want to make sure that our MilitaryAvenue Partners are up to date; that they are in business and serving their military-community! When your ad is coming up to its expiration date we will send you an email reminding you to Renew Your ad. It's easy! If you have a Free Ad just click on Renew, available during your renewal period, and you are set for another year. If you have a paid ad, a great way to be above the competition!, click on Renew, pay via credit card or check, and submit. Thank you again for joining us on MilitaryAvenue.com. If you need additional help visit our Help page. If you have additional questions send an email to us at sales@militaryavenue.com or dale@militaryavenue.com. We are happy to serve those that serve our well-deserving Military and families! MilitaryAvenue.com provides the STREET between the inside the gate community and Your outside the gate business! Thank you, as a MilitaryAvenue Partner, for being a /positive/ military-supporter! Thank you for welcoming them in to your community. Thank you for showing the families that their community stands behind them. Be sure to follow as President Barack Obama unveils government-wide plans to strengthen military family support. The governments support is important! But even more important is your support! We want you to be engaged with your local military-families! As you get to know their lifestyle, what is important to them, what changes are happening on post / base, you will find it easier to tailor your business-model to include their needs, then in turn, bring in new customers and keep current customers happy. With this in mind, we are happy to introduce: "MilitaryAvenue Partner Bulletins". As we post articles on MilitaryAvenue.com for our military-families, we keep /you/ in mind, the businesses serving them. If there is an article you should read we will pass it along, titled MilitaryAvenue.com Bulletin. So be sure to add, leanne@militaryavenue.com to your email list. We look forward to serving you, the businesses that serve our military-families! We appreciate what you do for our military and their families! Part of our appreciation is a free ad through our MilitaryAvenue Partner Program. To ring in the new year, and the success ahead for all of us, we would like to give you a free First Class Package (a $60 value). What does this mean? 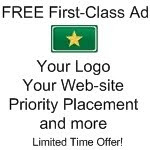 A First-Class can make your ad visually appealing and draw in more customers (and can increase visits to your own web page with a direct link!) What a great deal! But what if you already invested $60 in to a First-Class package or higher, like many MilitaryAvenue Partners? Those of you with an upgraded packages can use the $60 to reduce the cost at an even higher level; a General's Package or Featured Partner, perhaps! Build your new ad and at checkout use the Coupon Code military60. (Don't forget to click Apply after entering military60 to make your 1st class package /free/ or to lower the cost of another package.) We will review your new-ad and if you meet our guidelines we will approve and place it on the site so that the military-community can get to know you and your company! We wish you all the success that a new year brings! From your MilitaryAvenue Team, Happy New Year! This coupon code expires on 3/31/2011. So don't delay! We just made it easier for you to share your Military Discount with others! All of our partners' MilitaryAvenue Ads have a Facebook-Share button. Click on it and Share your discount with your friends and family. Let them know that YOU stand behind our troops and their families. You can find your MilitaryAvenue Partner ad a few different ways. Our Military Rewards Finder is straight-forward and easy to use: http://www.militaryavenue.com/RewardFinder.aspx After you select your local installation from the Reward Finder, click on the red-button, Military Rewards, in the top left corner, find your ad and then click on 'More Info', under View Coupon on the right hand-side! You will notice a blue "Share" box in the right hand corner of your ad. This links to Facebook (with a link to your ad) and makes it easy to get the word out! Still have questions? Jot us a note! We would love to hear from you.